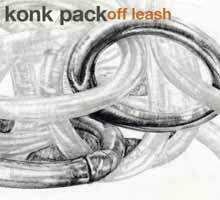 Off Leash is the third release of the delicate high-energy trio Konk Pack – founded in 1998 and made up of Thomas Lehn on EMS-synthesizer, Roger Turner on drums and Tim Hodgkinson on la-top steel guitar and clarinet. Big Deep (1999, GROB 102) was a selection of their first concerts: Warp Out (2001, GROB 323) was the first studio recording. Off Leash is a live recording again, from a concert in Utrecht in 2001 that was made under most favorable conditions conceivable. The sound is superb, the details of the live performance can be heard in the CD’s tonal image, the instruments are present and clear. If you close your eyes, you can easily imagine sitting directly in a stirring concert. But what are the best recording conditions worth with the music cannot keep with them? Off Leash bears up to the musicians’ critical ears. For the first time they are so convinced of their own concert that they found it valuable to release it in its entirety on a CD. (This, by the way, is why the CD is only being released now: they listened to the music again and again, checked it, compared it to other recordings, and then it was mastered by Thomas Lehn in the end.) For the first time, Off Leash offers the opportunity of following an entire Konk Pack improvisation in real time, without any post production dramaturgy and cosmetics. The extremely powerful passages, their legendary free punk, is in a perfectly balanced proportion to the peaceful, sometimes fragile, passages that nearly crumble apart. An essential reason for this is the radically horizontal improvisational method of the musicians. All three constantly play with each other. There is no fore or background, no soloists and no accompaniment; in general no solo and no “feature” of one individual. The system “Konk Pack” means that each has to constantly keep the other two in his ear. Their music is and remains consequently collective. Off Leash, the Utrecht concert, is currently the best live recording of their holy palaver. The cover art work is from Tim Hodgkinson and Roger Turner.